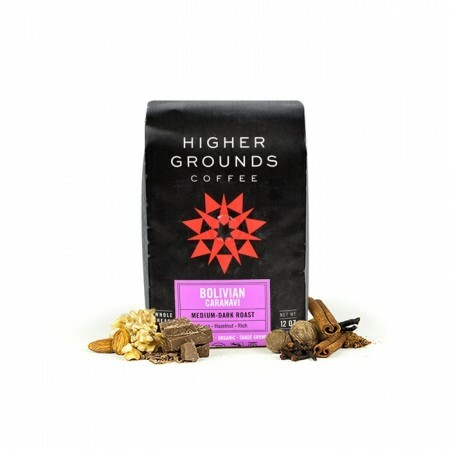 This is the Bolivia Caranavi brought to you by Higher Grounds Coffee. This Organic and Fair Trade certified coffee was sourced from the growing region of Caranavi Province in Bolivia and was produced by the Union Pro-Agro, AIPEP, and Mejillones cooperatives between 1,000 - 1,750 meters. A true medium roast with tasting notes of cocoa and hazelnut, this coffee is rich and comforting. Roast was much lighter than expected, I would not consider the flavor to be rich as described. Overall not a bad coffee, just light on flavor. This tasted like a true medium roast: smooth with some acidity. Chocolate and caramel notes were evident. We both enjoyed this one. Excellent! We normally like light and medium roasts so we were hesitant, but the smoothness of the beans and freshness was amazing. Keep 'em coming! I liked the flavor on this, as my first time having freshly roasted coffee. I used no sugar, but still added some french vanilla creamer (for reference I usually add 2-3 spoons of sugar). Rated 4/5 because I have nothing to compare it to besides preground supermarket coffee. One day I dream of drinking coffee with nothing added. I'm not there yet. Did not like the one. It smelled not very fresh and as if it had been over roasted. I brewed a cup on my Chem ex and the taste confirmed the smell. I ended up throwing the bag away. Would like a refund or another bag sent in it's place please. This a great tasting coffee. The Nutty flavor really comes through and provides a very pleasing after taste. Fine. Doesn't really stand out from the rest of the collection. Excellent roast! I cant decide if it's better as an espresso or pour over but both are satisfying! Smooth, rich, mellow chocolate/cocoa notes. Not bitter, not acidic, and nutty notes are a nice 'hint' of flavor without being overpowering. Very good body, as well. I like this! Didn’t like the flavor and it was too acidic and mild. Pretty smooth coffee with some nice nutty notes. A bit weak tasting, however. Good cup! Once I made the grind a bit coarser than usual, the taste really came out. Hazlenut came through very distinctly. Really good, not too bitter. One of my favorites. I don't know what it is, but no matter what I do, this coffee tastes overly bitter. I don't taste any of the flavor notes that are listed. I would not want this coffee again.